We understand that the average person spends up to 90% of their life indoors. According to the Environmental Protection Agency, 72% of the total chemical exposure experienced in a lifetime comes from indoor sources. Products that make up a building's construction can be sources of that exposure. We believe it is in the best interest of public welfare and the environment to eliminate and reduce negative impacts associated with building materials. 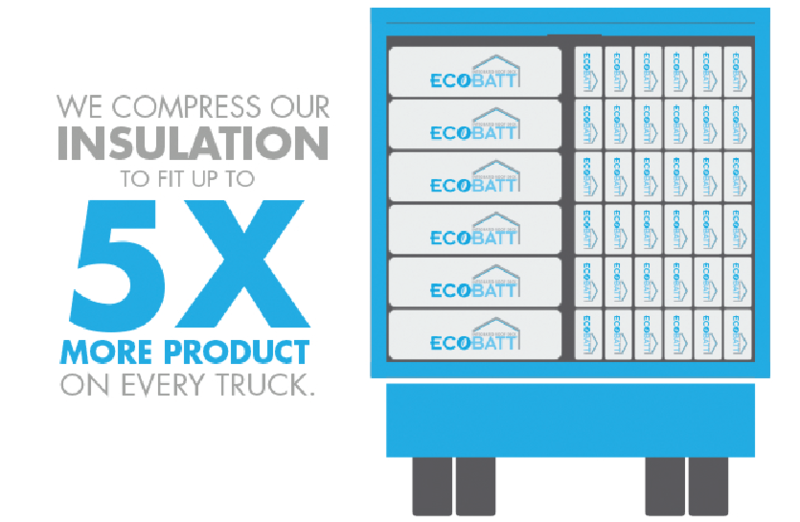 That’s why we are proud to be the first US company to provide a formaldehyde-free bio-based binder for all of our insulation products. Our number one priority is to provide products that conserve energy and preserve natural resources for a sustainable future. Throughout all the life cycle stages, we are committed to making our products greener and more sustainable. Below you’ll find some of the things we do to fulfill this commitment. 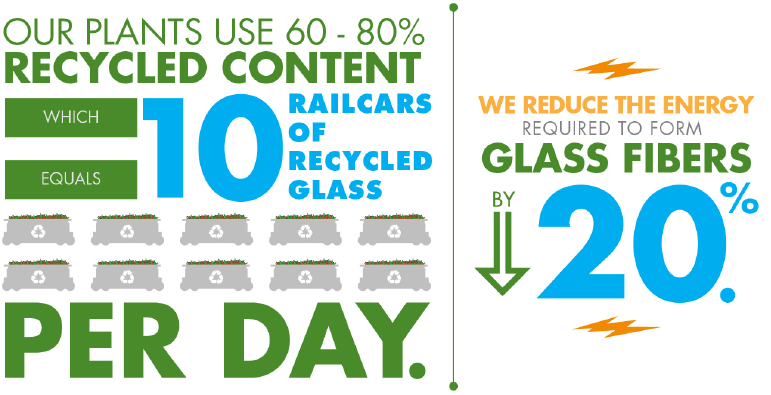 Our plants use 60 – 80% recycled content – which translates to about 10 railcars of recycled glass cullet a day. 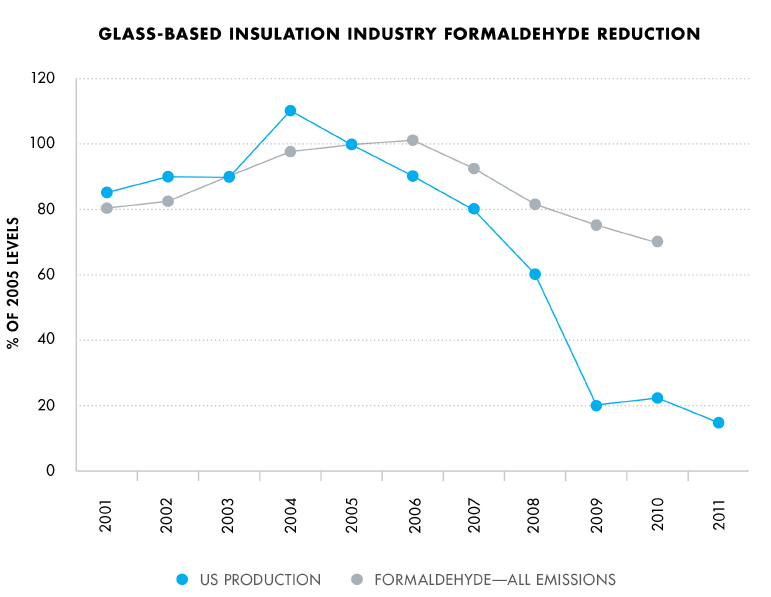 By leveraging so much recycled content, we reduce the energy required to form glass fibers by 20%. If we use even 60% recycled content, then mining impacts are reduced proportionately. Manson and Knauf's bio-based ECOSE Technology is derived from corn. On average, the Knauf Family Farm produces one half the amount of corn we use to make our products on an annual basis, which is equal to 5,000 acres. While we don’t grow the corn used in our products, the use of corn has a significant carbon sequestration impact on our processes. For instance, the use of corn actually offsets the carbon impact of some of the ancillary facers used on our products. In 2008, Manson and Knauf Insulation launched perhaps the nation’s largest formaldehyde-free green chemistry initiative called ECOSE Technology. Offering this into the building materials marketplace quickly transformed the entire glass mineral fiber industry toward bio-based chemistries. Today phenol-formaldehyde (PF) based resins are largely a thing of the past with regard to large volume mineral fiber based insulation products. Manson and Knauf have also launched a new business venture to assist other industries in accessing ECOSE Technology for their processes. 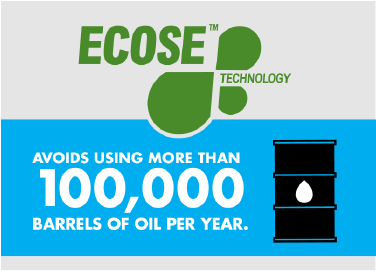 In a given year, using corn-based ECOSE Technology instead of phenol & formaldehyde avoids the equivalent of more than 100,000 barrels of oil in North America alone. Following the launch of our ECOSE Technology in 2009, we had transformed all of our products and processes to this new technology. Using our bio-based ECOSE Technology has removed phenol and formaldehyde from our stack emissions. By 2012, the entire industry had followed our lead. This initiative not only established Manson and Knauf Insulation in a leadership position, but it had a transformative impact on our industry in general. 1. 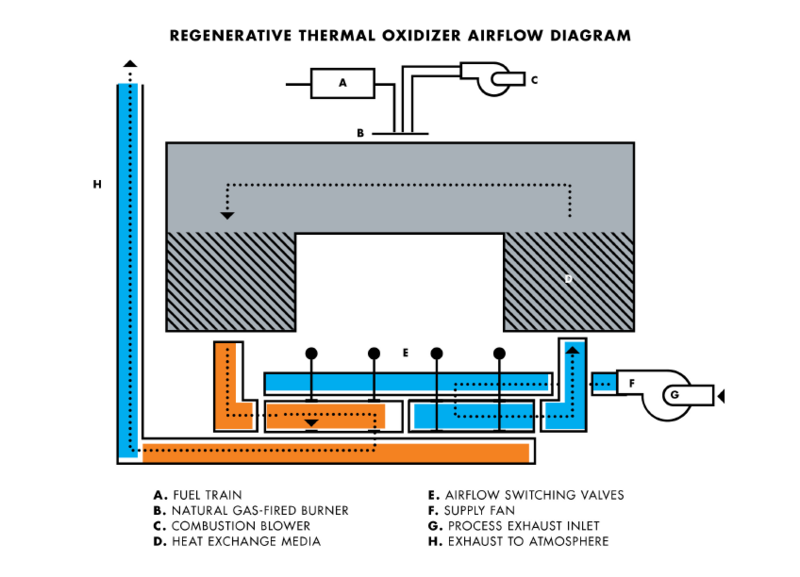 Regenerative thermal oxidizers Manson and Knauf Insulation use regenerative thermal oxidizers (RTO) to capture and recycle much of the energy we used to cure our products. RTO is equipment used for the treatment of exhaust air. Our ovens exhaust into a ceramic heat exchange media to capture and reuse the heat in the exhausted air. Therefore, the amount of energy required to cure our product is reduced substantially. 2. Recycling As you can see below, everything we do starts with recycling. 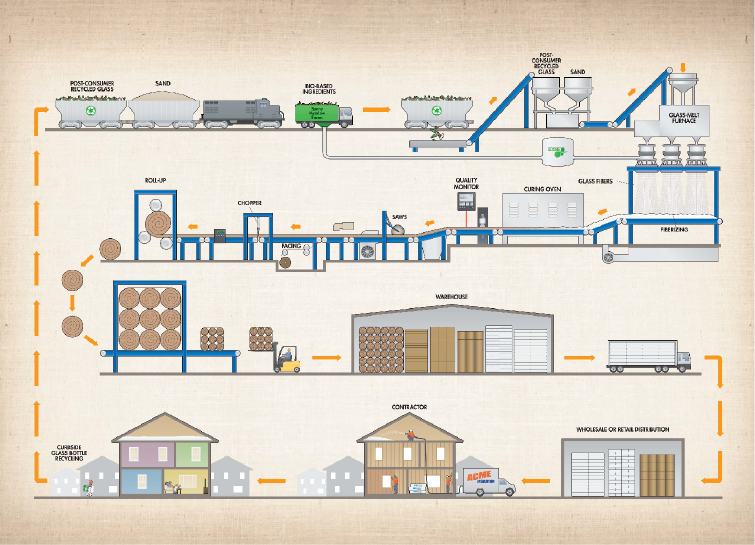 Our plant uses as much as 80% recycled content. While our only option is to landfill our products at end of life, that doesn’t stop us from encouraging consumers to recycle other products, particularly glass bottles. Continuous improvement is key to our sustainable development. Globally, we maintain the following Bureau Veritas certifications: ISO 9000, 14000, and 50001. These certifications relate to quality management systems, energy management and environmental management efforts. For more information on our current continuous improvement efforts, please review our global sustainability report. In the past, a label regarding the carcinogenic potential of insulation made from glass fibers was required on all packaging. Following forty years of research, glass mineral wool has been exonerated entirely. Glass mineral wool is comprised of fibers that are biosoluble, meaning that the fibers dissolve in the body in a short period of time and exit the body with normal bodily functions. The scrutiny glass mineral wool has undergone is now seen as proof of its safety. the Red List. Manson Insulation has chosen the Health Product Declaration® (HPD) Collaborative as its standard for reporting building product content and associated health information. EUCEB tested Glass fiber is perhaps the most widely studied building material available today. All of our processes and formulations are voluntarily third-party audited for compliance with the health and safety exoneration criteria for glass and rock based fiber through the European Certification Board for Mineral Wool Products (EUCEB) exoneration process. This guarantees the formulations are biosoluble and pose no health concerns. Having 35 years of research behind its safety, perhaps no other building material has been as thoroughly evaluated as fiberglass products. We believe a safe product is one that has been thoroughly evaluated. Our products offer a vast array of potential credits for major green building rating systems, including: WELL, LEED v4, International Green Construction Code, Green Guide for Heath Care, NAHB Green Building Standard and more. Visit the green building rating systems page to see all the credits you can earn using Manson and Knauf Insulation products. Manson and Knauf are recycling advocates. 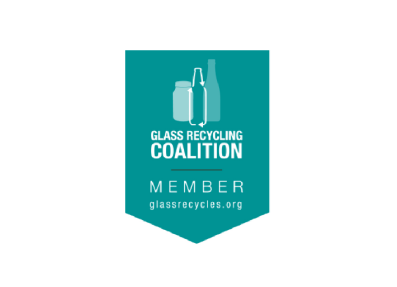 We take every opportunity to advocate for recycling and financially support the Glass Recycling Coalition (GRC). We feel that a comprehensive understanding of the benefits of recycling will lead to greater recycling adoption and more promotion by state and local governments. While our only option is to landfill our products at end of life, that doesn’t stop us from encouraging consumers to recycle other products, particularly glass bottles. Environment PCR and ISO 14025.